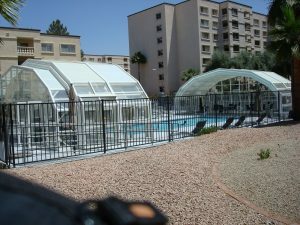 Permanent pool enclosure is an economic approach for small to medium residential swimming pools. Also, the permanent structure can be used as an enclosed recreational space. Temporary enclosure should be considered only for one time event. The most economic approach to a temporary enclosure is tent rental. The retractable pool enclosure provides the best approach to any condition situation. It can be totally enclosed just as a permanent structure. It can be partially open or even completely open. Retractable pool enclosure can accommodate any size of a residential swimming pool as well as any size of a large commercial pool. The retractable pool enclosure can be easily open and close by one person and the commercial size by no more than two people. There are several manufacturers of pool enclosures today in the USA, Canada and Europe offering varieties of design and qualities. Consumers can consult with a local expert in the enclosure and sunroom products and design. 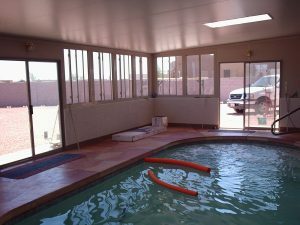 Additional pool enclosures photos .